Sewn Necklaces Part 2 | Oh Sarah O ! My mom's birthday was nearly a month ago, and I am finally getting around to finishing her birthday present requests. Last spring, I made a few sewn necklaces using a tutorial from CraftStylish and my mom liked them and asked if I would make her a similar one for her birthday. So, I made 2 necklaces. The first one definitely follows the tutorial from CraftStylish. But, the second one is a little different. I was inspired by a fancy bib necklace that I saw online (sorry, I don't remember where it came from but, it was pricey $$$). 1. 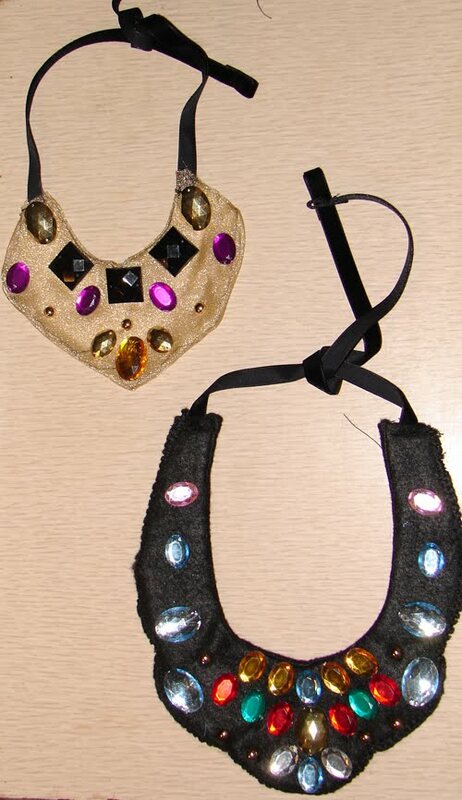 Trace and cut out the shape you want your bib necklace to be on your 2 pieces of craft felt. For my necklace, I traced the shape of a bib necklace that I already owned. 2. Trace one of your felt bib pieces onto your interfacing. Then, redraw the shape of your bib on the interfacing so that the bib on the interfacing is slightly smaller than the 2 craft felt bib shapes (by approx. 1/2 in.). Cut the smaller bib shape out of the interfacing. 3. Now you're going to make a bib sandwich. Take your 2 felt bib pieces, pin and a-line them with your smaller interfacing bib piece in the middle. 4. Sew along the top and bottom of the necklace using a zig-zag stitch leaving 2 1 inch openings on each side for the ribbon. 5. Cut your ribbon in half and insert one ribbon 1/2 inch into the hole. Top-stitch each ribbon in place. 6. Arrange and embellish your necklace however you like. You can sew-on your jewels or use a hot glue gun.